Graniterock provided a decorative boulder for the Carmel memorial "Resolve and Remembrance" to permanently housea commemorative section of Ibeam from the buildings destroyed Sept. 11, 2001 in New York. Subsequently, a scholarship was set up to offer high school students an opportunity to "Resolve and Remember" the terror attacks through an essay contest, and Graniterock again contributed. An extremely bright and highly motivated Monterey High School senior, Tama Michael Gabriel Henderson-Semo, won this year's contest, for his beautiful essay honoring the tragedy. 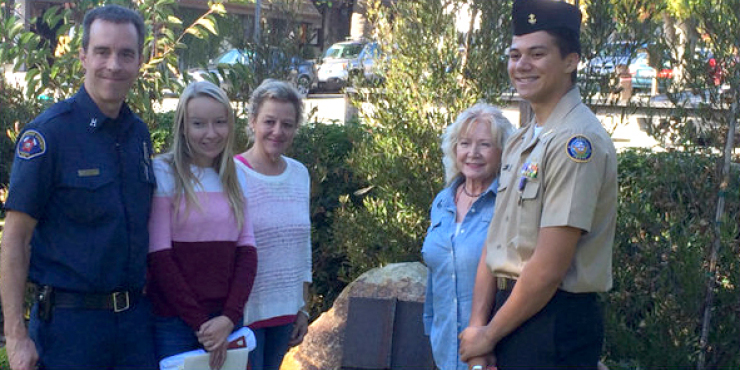 Graniterock provided the scholarship to Tama Nov. 9, 2014 at the memorial site in Carmel's Devendorf Park. Thanks to Keith Severson for leading this effort.